Selecting a top flight bow for your needs is nowhere near as simple or as straightforward a process as most people make it out to be. For starters, everyone has different needs when they are getting ready to buy a topflight compound bow. Secondly, there are so many different options promising the moon and the stars when it comes to capabilities that it can feel like a real chore sorting through the different bows out there. Thankfully though, if you focus on world class options like the Bear Archery Cruzer, you won’t ever have to worry about making the wrong choice. 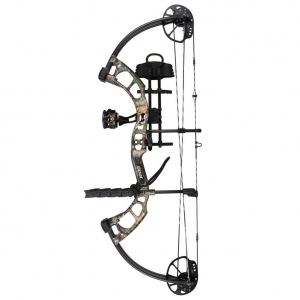 This is a special compound bow, one capable of amazing accuracy and plenty of punch and power. At the end of the day, these specs are really something surprising (in the best of ways) for a bow this cheap. You’re going to be able to get top quality and performance at a price point far below what most pay for the same benefits. It’s a lot of fun to shoot – and capable, too! We know that a Bear Archery Cruzer review overflowing with positive comments is going to look a little one sided, and we’d love nothing more than to tell you that there are some drawbacks and deal breakers that will make you think twice before buying this bow. Sure, there are a couple of small issues here and there (sometimes adjusting your bow can take more time than expected, sometimes the cams aren’t as smooth out of a cold shot as they could be, etc), but at the end of the day people love this bow for a real reason – it’s close to perfect for what it does and you just can’t beat the price. Digging a little deeper into how people feel about the Bear Archery Cruzer returns tons and tons of almost glowingly positive reviews. People are going nuts for this brand new option, especially those that are relatively new to the world of archery. Folks that have purchased this bow really appreciate its flexibility and adaptability. Having the chance to change the draw length and weight makes this a great bow for starters, novices, and experts alike looking for a new compound to add to their arsenal. All things considered, it’s really nice to see a USA based manufacturer taking the time to put together a top quality compound bow like the Bear Archery Cruzer. There are a lot of other options on the market today competing for your affections, but none of them make the most of new aluminum construction materials, a super smooth and buttery cam system, and an arrow stabilization solution that helps deliver arrows down range with the kind of precision you need these days. Combine all of that with the advanced and enhanced grip design to reduce fatigue and improve accuracy, the preload quad limbs that improve and ramp up power without sacrificing accuracy, and a million other (or so it seems) smart little engineering additions and it becomes effortless to see why so many love the Bear Archery Cruzer.